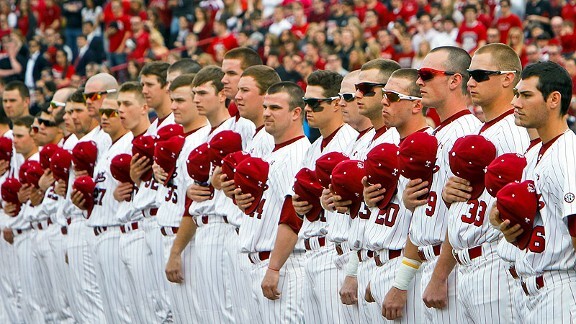 The South Carolina Gamecocks have played baseball on the collegiate level since 1895. In 1992 they joined the Southeastern Conference as a baseball program and currently play in the SEC’s Eastern Division. The Gamecocks are one of the most successful — if not the most successful — Division 1 baseball team over the past decade, winning the College World Series in 2010 and 2011 and also finishing runner up twice. Gamecock baseball plays their home games at Carolina Stadium, a 8242 capacity facility in Columbia, South Carolina. Their team colors are garnet and black. Their head coach is Chad Holbrook, who in 2013 replaced the Gamecocks legendary long time skipper Ray Tanner. In 1970 was a watershed year in Gamecock baseball history. That is when South Carolina hired former New York Yankees second baseman and South Carolina native Bobby Richardson as manager. 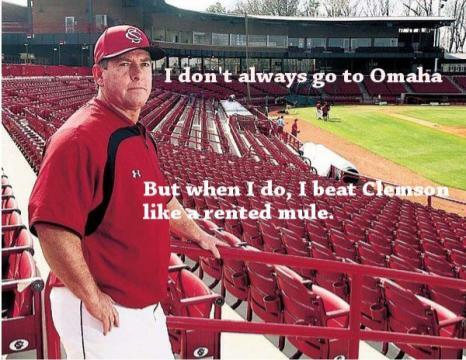 Previous to Richardson’s hiring, the Gamecocks had been a middling to mediocre college baseball program. But Richardson immediately gave them relevance taking them to the College World Series for the first time in 1974 and then getting all the way to the national title game in 1975, which they lost to Texas. Richardson left the Gamecocks in 1976, but the program barely missed a beat. In fact new coach June Raines took the team back to the national title game in his first year on the job. This time they lost to Arizona State. Raines would coach the Gamecocks for 20 years. During that time period they would win 763 games, reach four College World Series and appear in 10 NCAA Tournaments. South Carolina Gamecock baseball would also join the SEC during Raines’s tenure. As successful as Richardson and Raines were, the Gamecock’s next coach, Ray Tanner, was even more so. Tanner had been somewhat of a boy wonder, taking over the N.C State baseball program at 28 and guiding the Wolfpack to new heights. After nine years there he was ready for a bigger challenge and he moved down south to Columbia. Tanner made his first College World Series in 2002, with the team finishing runner-up to Texas yet again. The Gamecocks also made the College World Series in 2003 and 2004. In 2010, they finally broke through. Led by Jackie Bradley Jr., the Gamecocks won the championship best-of-three two games to nothing over the UCLA Bruins. In 2011 they became the sixth team in Division 1 baseball history to win back-to-back championships when they prevailed over SEC rival Florida, again in two games.